In Pittsburgh, a combined 88% of Downtown commuters either take public transit, drive single-occupancy vehicles, or use people-powered modes like biking or walking to get to work; when we talk about daily commuter transportation options the focus is often on the split between these three popular modes. But in recent years, ride sharing through apps like Uber and Lyft has grown as a practical choice for those looking for alternative modes of transportation in urban areas. We took a cursory look at how this new technology is changing the way we think about getting around the city by comparing two key indices in a few focus areas: Uber fare estimates and the price of parking in the Golden Triangle. We began with a list of a few areas inside and outside of the city that had high percentages of vehicular commuters and/or were physically far away from key public transit corridors (image below). Scroll through the slide show below (using the reference map above for label information) to see how different parts of Allegheny County compare when traveling to and from Downtown using Uber on a typical weekday. By isolating these areas, we found that communities located near high-volume roads often had shorter travel times despite large distances which lowered the fare, such as within Ross Township. Similarly, neighborhoods that are physically closer but located in more dense areas see higher fares, like Highland Park. In this way, Uber fares can measure the indirect costs of driving, putting a metric to both time and energy spent commuting on the road. The biggest daily cost to a commuter driving a single-occupancy vehicle to and from the workplace is usually parking. Earlier this month we published a blog post detailing the various rates that garages and surface lots charge for those spending the workday downtown. 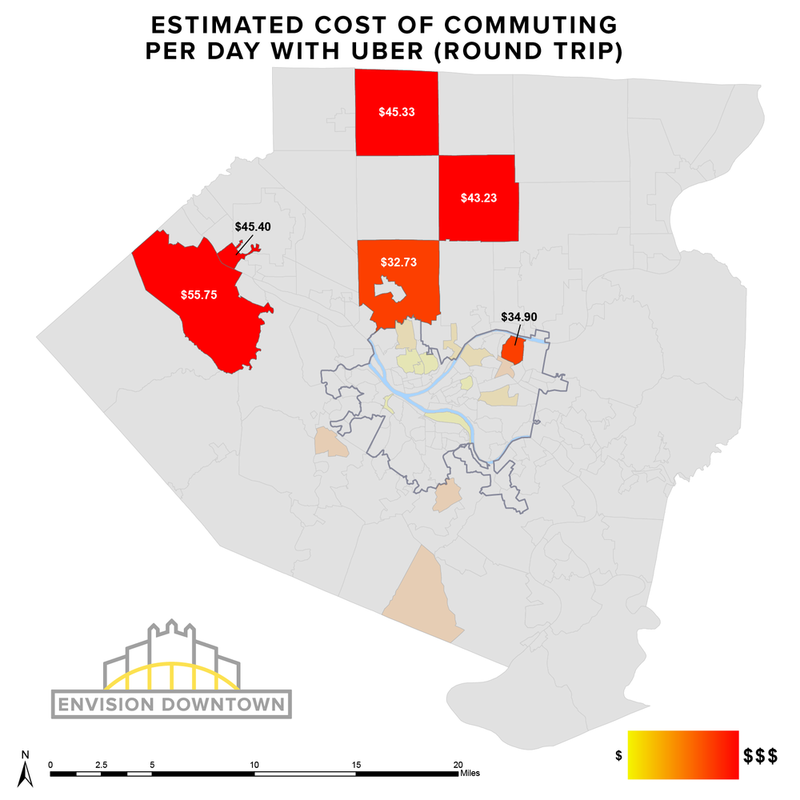 By comparing this fixed cost to our estimates of ride-sharing fares we can realistically imitate the opportunity cost decision-making process of a Downtown commuter. If you are a driver who parks in one of the 77 lots and garages in Downtown, depending on where you come from and where you prefer to park one of these alternative options may appeal to you. 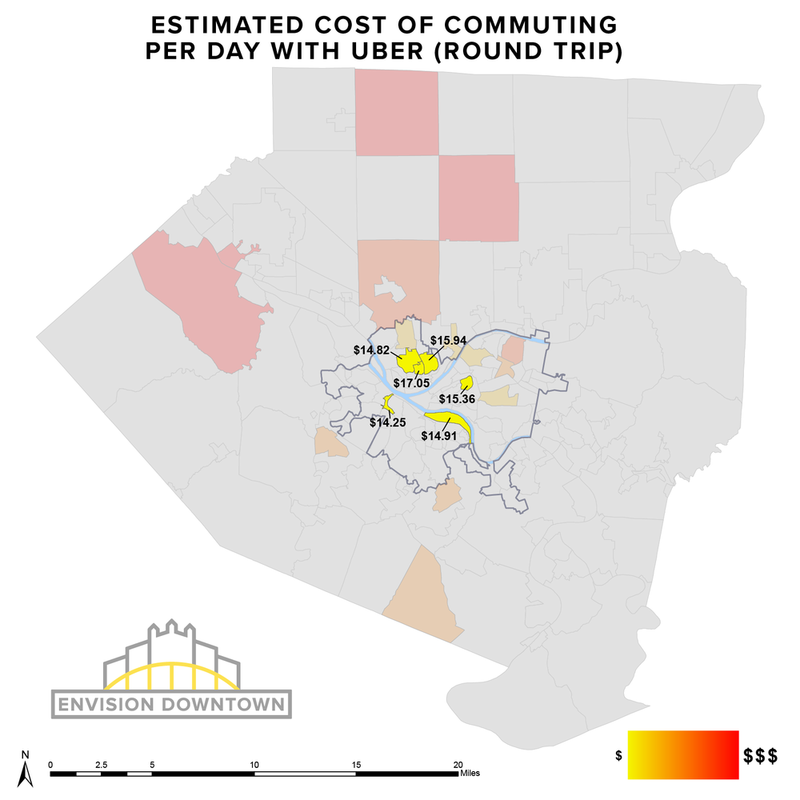 We also noticed a general pattern of distance distribution: if you live within 3 miles of the Central Business District, in many cases it is actually cheaper to take an Uber than the average person pays to park. 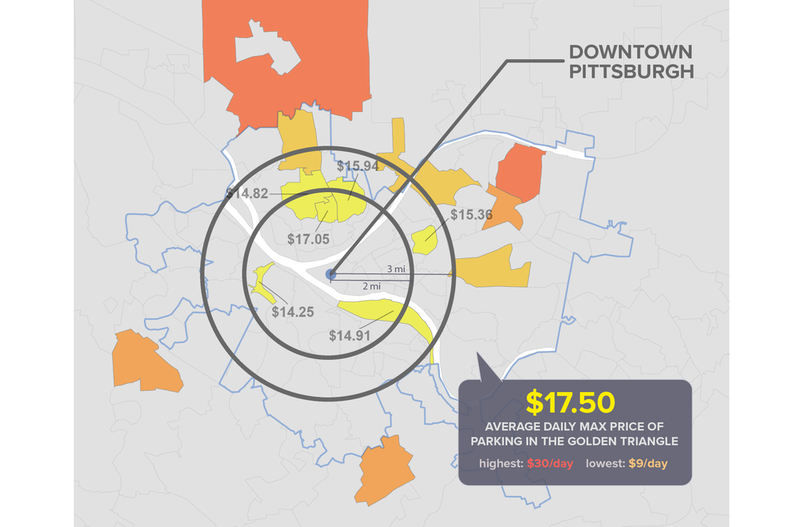 The average cost of parking for an entire day in the Golden Triangle $17.50, and can run as high as $30. If you live in the northern or western part of Squirrel Hill and prefer to drive, chances are you are paying more than an Uber's round-trip cost. A switch to ride-sharing may not make sense if you live in Carnegie, but based on proximity to the West Busway you could take a different cost-cutting measure with a shift to Park-and-Ride. Of course there are other trade-off costs involved in using ride-share apps -- both personal and on a larger scale -- including air quality concerns, lack of influence on congestion, and places of work that subsidize parking spaces or transit. But by opening up our analysis outside of what we expect daily transportation to look like we are able to approach commuting as an innovative field, creating more choices for more people. Uber estimates were determined using a combination of Google Maps online traffic prediction and the formula given for fares on Uber’s website. The geographic center of each neighborhood was used to calculate distance, as well as a range of time dependent on daily traffic levels; the maps above reflect a sliding scale of prices that are subject to change based on individual circumstances and the prices are not to be taken as steadfast fact. One-way morning and evening fares were combined to guess a typical round-trip. Uber does not publish detailed information about surge pricing, which can change minute-to-minute based on market forces, so the above study assumes a flat rate without a surcharge.